Would you like to be able to use Google maps to get directions by bike? 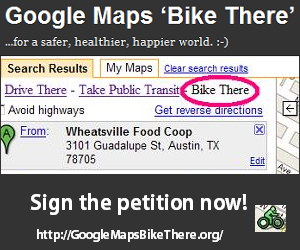 If so, please let Google know by signing the petition at GoogleMapsBikeThere.org. GoogleMapsBikeThere.org was created to ask Google to help us make the world safer for bicyclists by adding bicycle routes to Google Maps. Please sign the petition if you have not done so yet. The ‘Bike There’ is because that is the option we want to see added to Google Maps, along with ‘Drive There’ and ‘Take Public Transit’. NYC Bike Maps .com does not have the resources to undertake this project, but fully supports the idea and have signed the petition to show our support. As a side note, we sent Google a request to add bike paths, bike lanes, and bike routes several months before creating NYC Bike Maps .com.